Natural Light SAF12, Solar Powered Self-Contained Attic Ventilator Fan Kit. Includes Adjustable Solar Panel 12 Watt. Capacity 893 CFM (for 1260 SqFt area). Price/Kit. The solar powered attic fan is constructed of components that include photovoltaic module, heavy duty aluminum shroud cover, D.C. fan motor / blade assembly with support brackets, aluminum roof flashing/base and stainless steel wire mesh screen, powder coated finish. 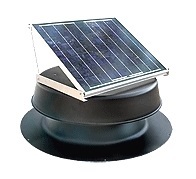 The roof mounted solar attic fan includes: a adjustable solar panel (12 watt), a heavy-duty aluminum powder-coated housing, powerful-quiet motor, motor isolation bracket, 5 wing fan blade, protective animal screen and heavy-duty leakproof aluminum flashing.